The holidays are right around the corner and this time of year can often feel simultaneously festive and frenzied. Here in Guelph the lights are up on houses, the ground is snow-covered and the local markets have been abuzz with gifts, ciders and carollers. Meanwhile, there is year-end accounting, bitter cold winds, a brimming calendar of social events, an endless to-do list and scarcely enough light hours to get even half of it all done. It’s easy to feel overwhelmed and want to hide away under a cozy blanket but I’m finally learning that this season is really a balancing act in finding time for both focusing in and having some fun. I’d been thinking about this a lot when the team at EILEEN FISHER asked if I’d be interested in sharing how I’m making space for what really matters this season. The notion of what ‘making space’ really means is different for everyone of course, but for me this season it has meant trusting my instincts, saying no when I need to and prioritizing time to be present with both myself and the people I care about most. I’m not balancing it all perfectly by any means but I have noticed a few critical elements that have made a big difference. 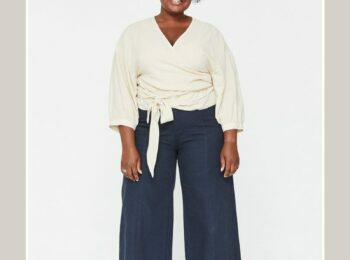 For instance, having pieces I can rely on again and again, like those in my closet from EILEEN FISHER, has been a huge stress saver when I’m getting ready for holiday events. How I’m making space to be present this holiday season. 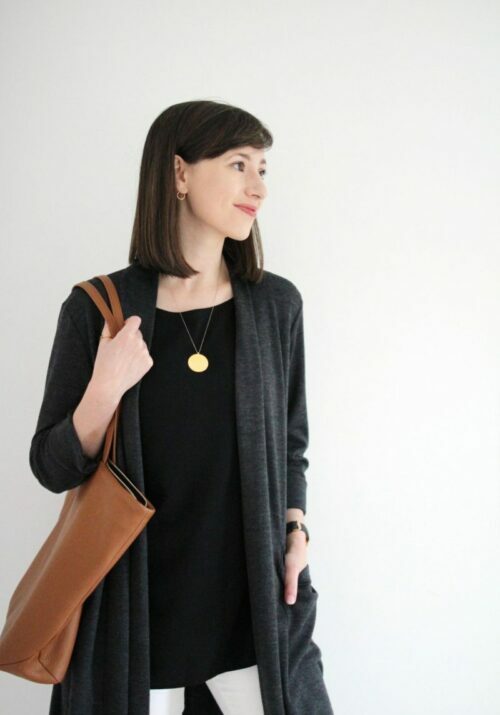 3 easy holiday outfits featuring the long shell from EILEEN FISHER. 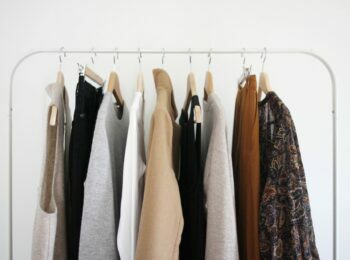 Simple styling tips anyone can apply to their closet this season. 1 – By saying YES to social events and NO to social media. I’m an introvert so social activities can be really draining but when I know I’ve got an event, a night out or a visit with a friend I plan ahead by limiting how much of my energy give to social media. This way I can be fully charged when I see people and better engage with the folks I get to see face-to-face instead of showing up already depleted. 2 – By not compromising on comfort. I used to try and up the ante on my personal style over the holidays and often felt like I had to really dress the part for dinner parties, lunches and other events. But this year I’ve been keeping it really simple. I’ve been repeating outfits as much as I can to save myself decision fatigue and if I know an outfit feels great and suits the festivities then why try to reinvent the wheel every time right? 3 – By focusing on gratitude. It’s easy to get wrapped up in wants and wish lists at this time of year but instead of focusing on what I don’t have, didn’t accomplish or would have done differently, I’m trying to steer my thinking in the opposite direction. I’m so grateful for the people (and animals!) in my life, the work I get to do here, the country I live in and all the opportunities I’ve been presented with. When I feel overwhelmed by obligations or as though I’m not doing enough, I’ve been trying to pause, take a few deep breaths, listen to my instincts and move forward thoughtfully instead of just reacting. Sometimes this means graciously saying no and sometimes it means digging deep and offering up more of myself. I find when action comes from a place of appreciation instead of overwhelm it’s much easier to make decisions. HOW ARE YOU MAKING SPACE FOR WHAT MATTERS THIS YEAR? I’D LOVE TO KNOW. 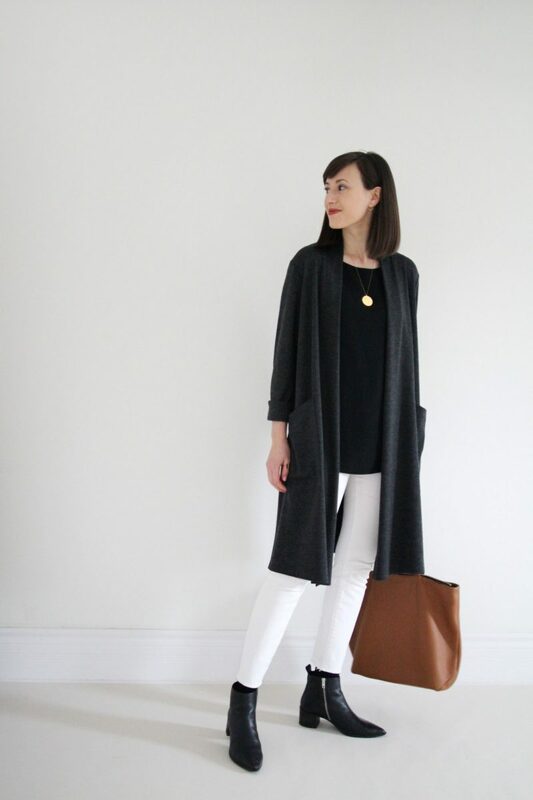 You might recognize this long shell from a collaboration I did with EILEEN FISHER at the start of 2017 (see it here) when I tested out a few pieces from The System, a collection of 8 timeless staples designed to be worn for a lifetime. Since then this piece has been a regular staple in my closet and when we started discussing this post I knew it was the perfect item to revisit and style into some new looks. The long shell is a piece I always reach for when I want to feel polished, sophisticated, stylish and most importantly, comfortable! 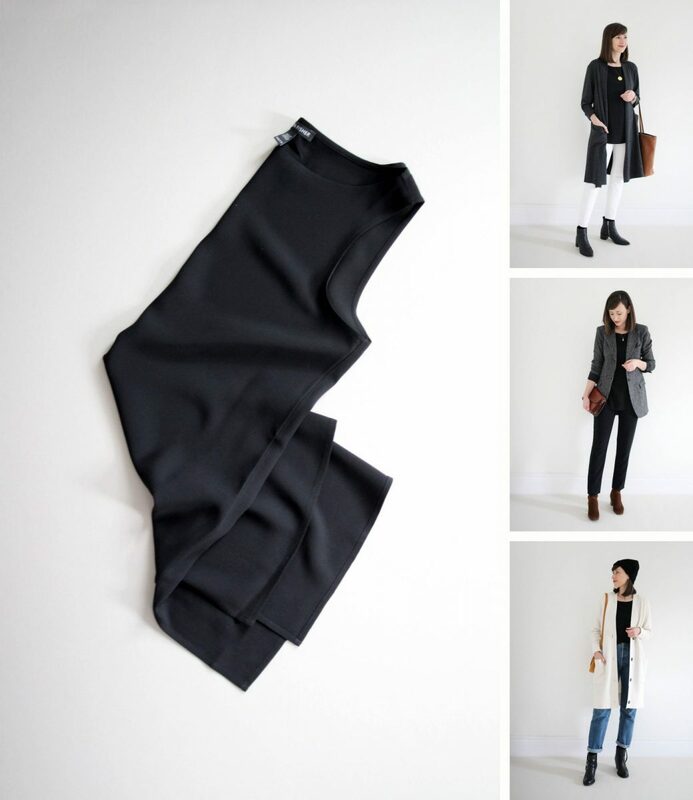 It’s the perfect length to wear loose over a slim or flowy pant or to tuck into a high waist or under a skirt. 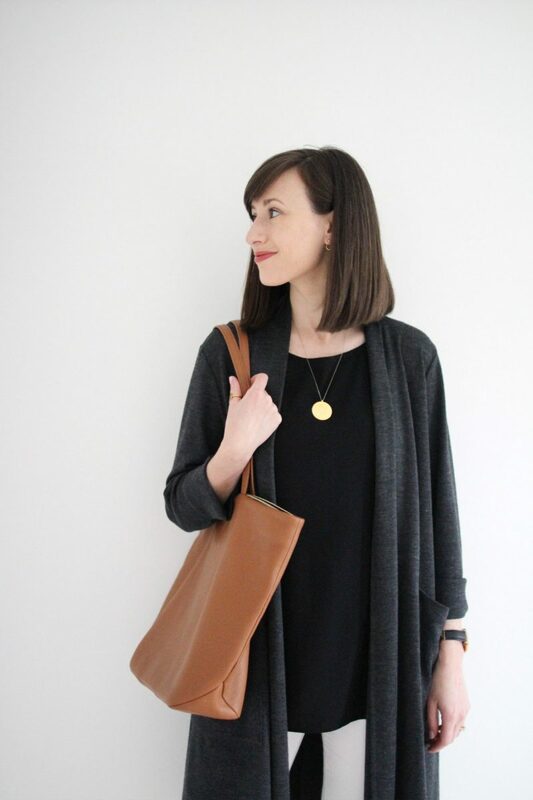 The neckline is elegant and perfect for layering under cardigans, blazers and necklaces. I also appreciate the longer hem at the back for a bit of added interest and more of a tunic length (you can see it better in look 2). It’s also a cinch to care for (machine wash, hang dry) and has held up brilliantly over the last couple of years. 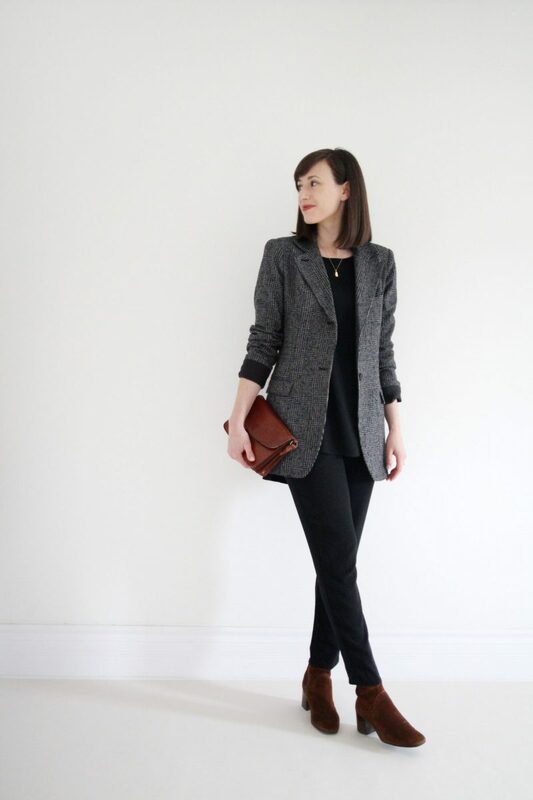 This first holiday look is a great one for any sort of casual event you’ve got on the calendar. Perhaps you’re hosting a small dinner party or heading to a neighbour’s place for cocktails or maybe you’re meeting friends for an event downtown. It’s put-together and chic and without feeling the least bit fussy. 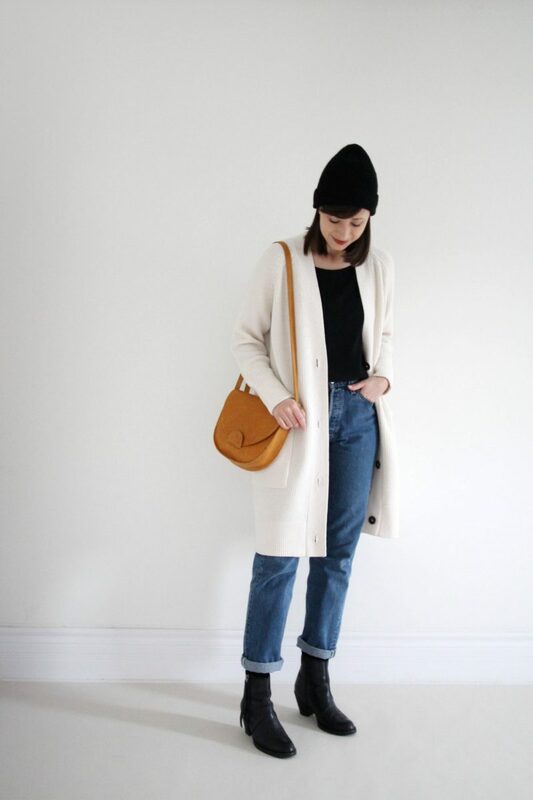 Just throw on a cozy coat and a big scarf and you’re all set! As you can see, my girl Evie approves! 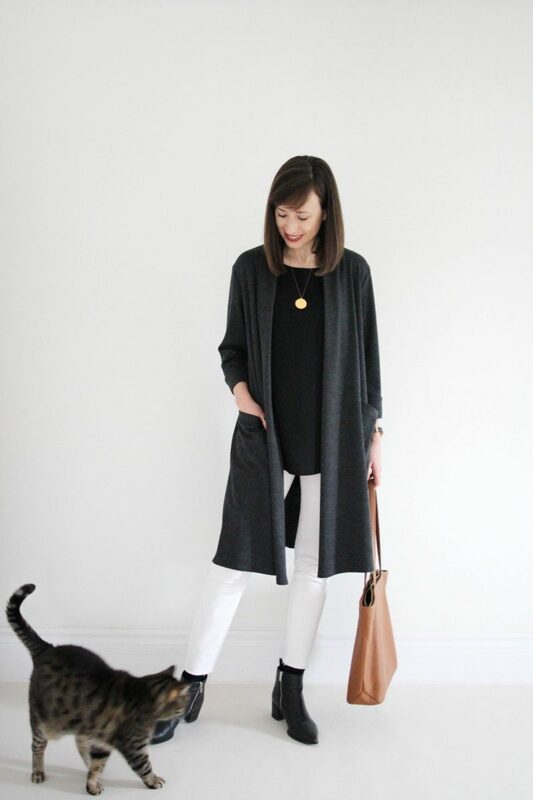 UNIQUE PROPORTIONS – The long shell is a slightly unexpected proportion and paired with an even longer cardigan it feels special and a little dressier than usual. 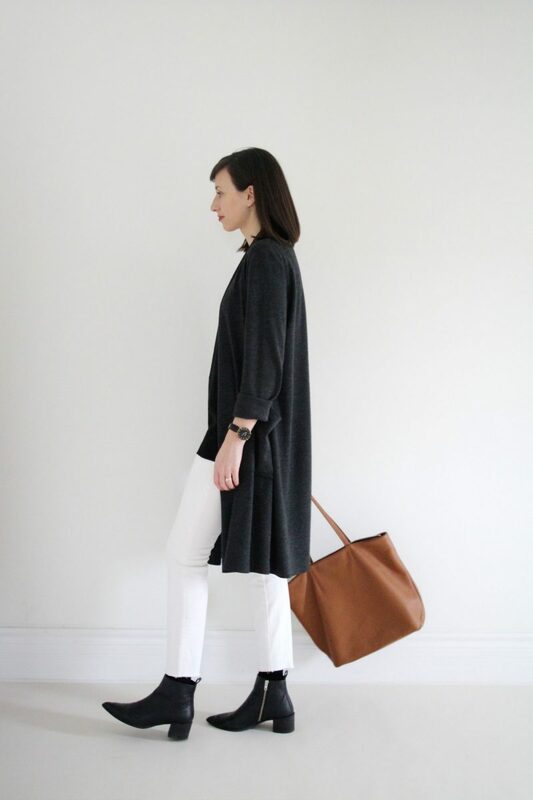 FRESH CONTRAST – A pair of jeans or black ponte pants would work with this look too but I felt that the white skinnies added a jolt of contrast and freshened up the palette of darker neutrals. 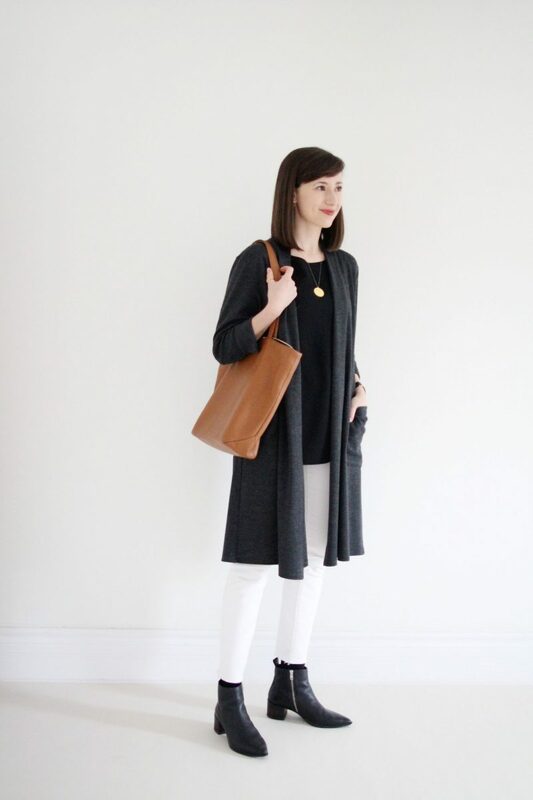 TOUCH OF STRUCTURE – A pointed-toe boot and a square tote add some structure and shape to an otherwise floaty look. REPEATING SHAPES – To add a bit of polish to this one I added my go-to accessory shape, the circle. By pairing a circular pendant, circle earring jacket, round watch face and thumb ring there is a subtle continuity peppered throughout the look that’s not overtly repetitive but gives a more cohesive feel overall. 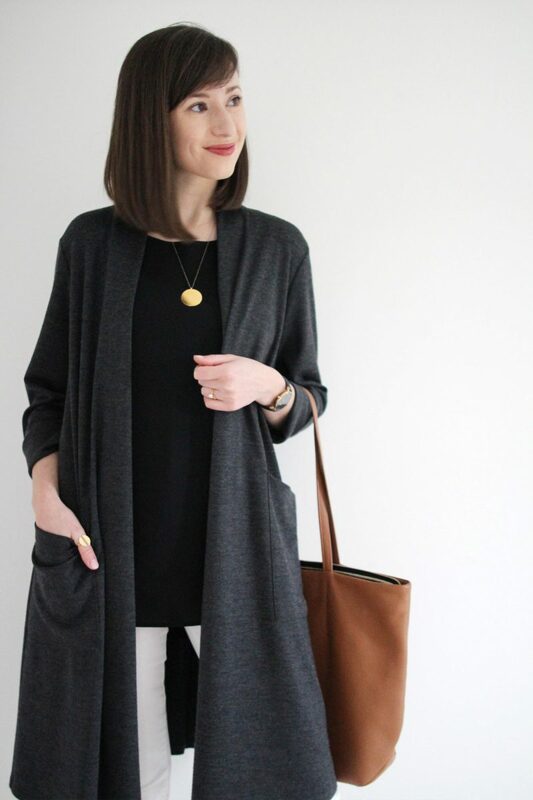 LONG GREY CARDIGAN – bought by me in 2017 – EILEEN FISHER – sold out – Similar options here, here, here (all three are on sale) and here. PANTS – bought by me – old – Linked to similar. This is one of my go-to uniforms for any sort of work related holiday event. It feels sophisticated, timeless and it’s super comfortable for any amount of standing and/or schmoozing the event may call for. I just throw on my camel coat and a cashmere scarf to stay streamlined and cozy outdoors. You bet I’ll be wearing this one on Friday for a lunch with some local influencers! ALL BLACK BASE – I love how easy it is to dress up an all black base like this one. In fact, it’s probably one of the most fool-proof ways to build a look. 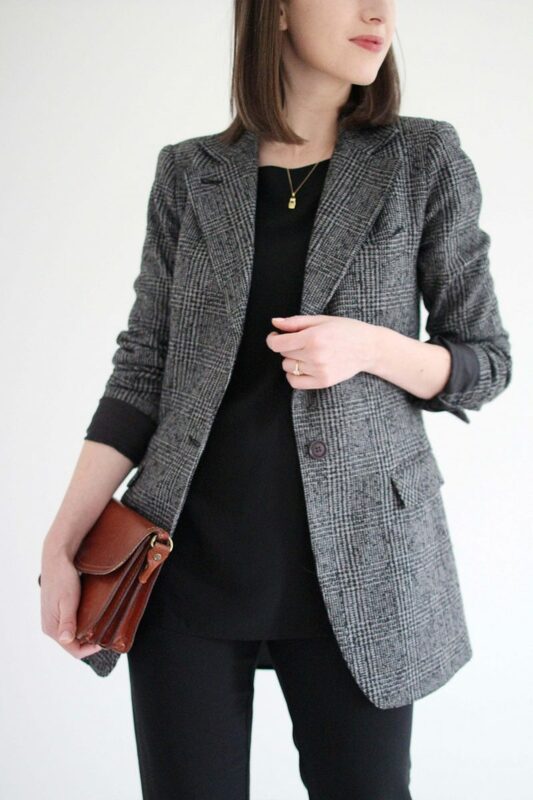 Then just adding a bit of texture through a blazer, sweater or jacket creates interest. 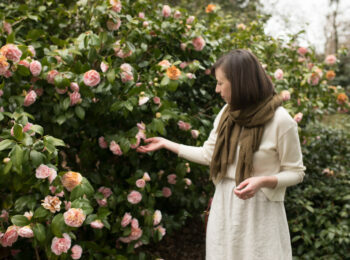 PUSHED UP SLEEVES – I’ve fully adopted this French style trick and use it all the time. 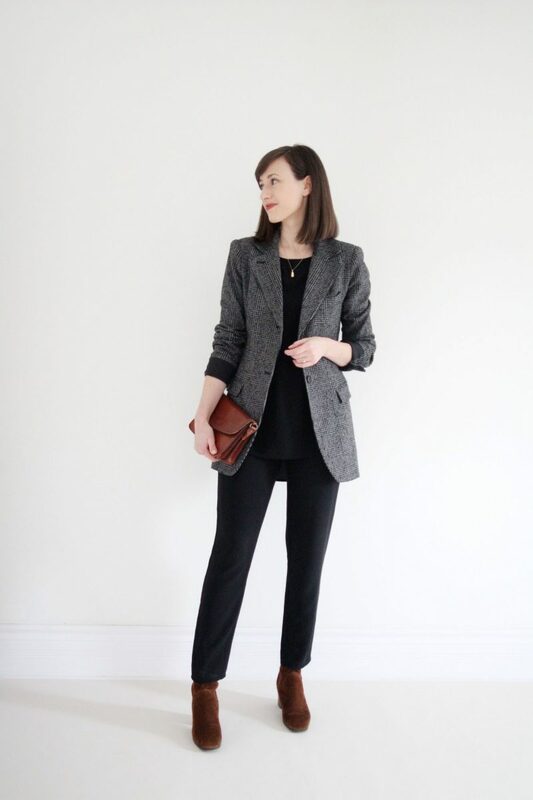 Rolling the cuffs of a blazer and pushing the sleeves up instantly takes a blazer from feeling corporate to casual. 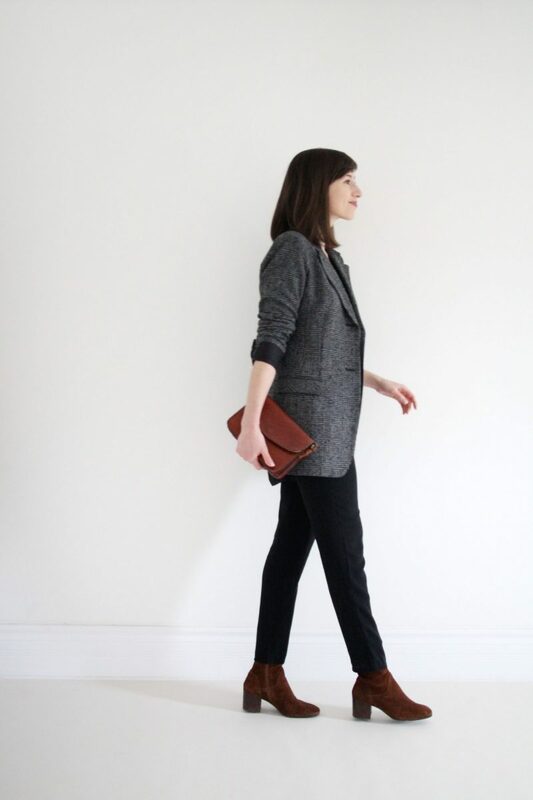 MATCHING ACCESSORIES – Adding a couple of elements of colour through my boots and clutch warm up the palette and add more depth to the look overall. A CONVERSATION STARTING ACCESSORY – Including one piece that’s a bit unusual or special (such as my new Woman Vase pendant) serves as a great conversation starter. So far I haven’t worn it once without at least one person asking me about it and it’s a great way to break the ice at events where you might not know lots of people. 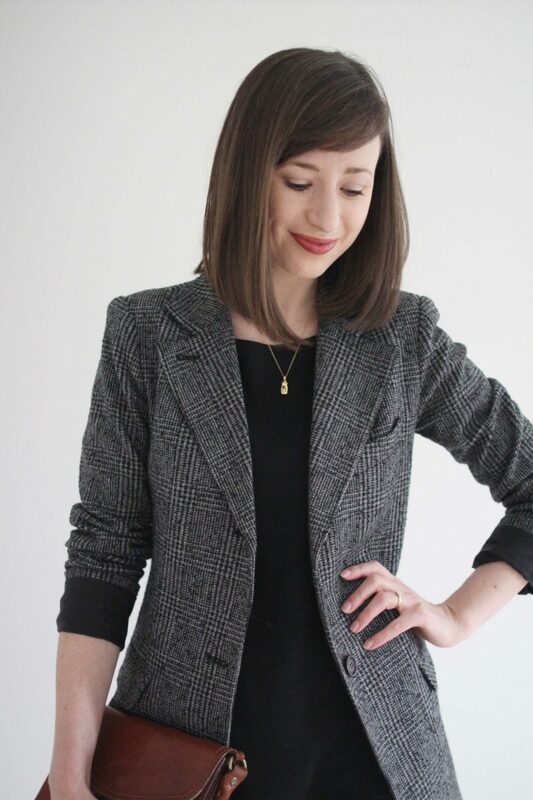 WOOL BLAZER – bought by me – SMYTHE – old – Made in Canada – Similar option here. CARIE BOOT – bought by me – AQUATALIA – $380 CAD (on sale!) – Weatherproof Suede – Made in Italy. 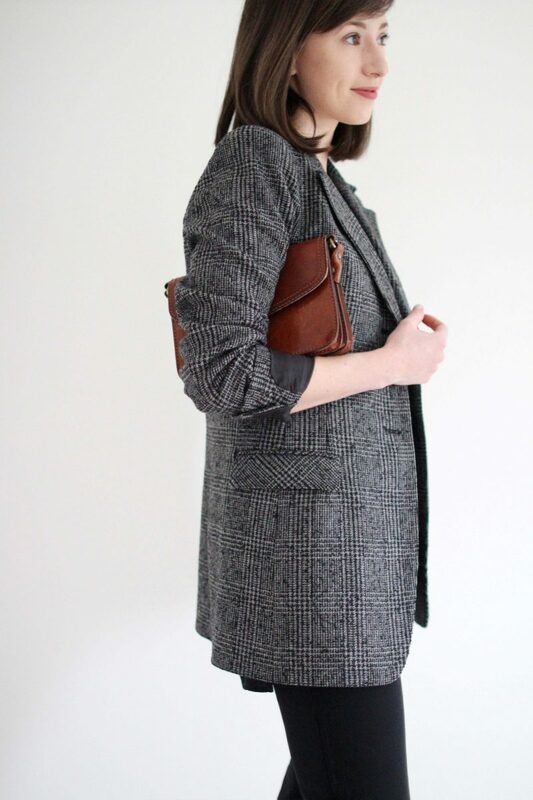 BAG – vintage – Similar option here and here. This one is my cider sipping, tree decorating, winter wandering, record listening, hanging out with my closest friends & family kind of outfit for the holidays. 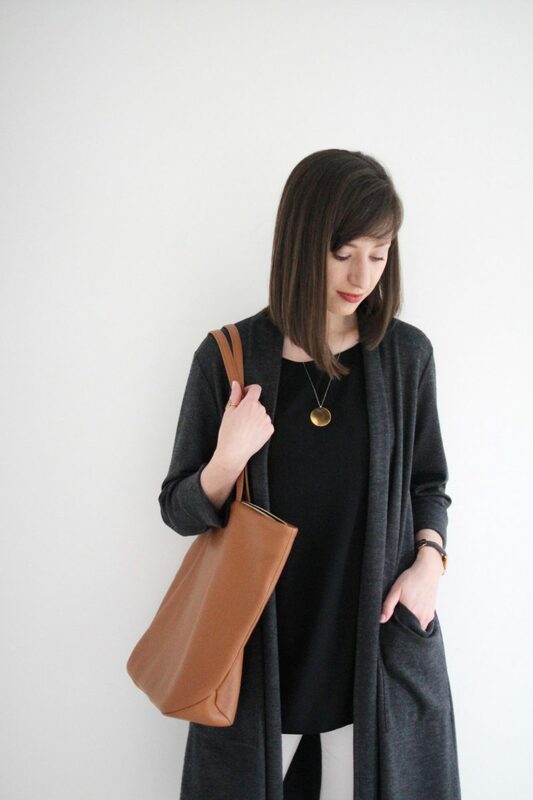 It’s cozy and relaxed but still feels presentable enough for lots of occasions. Just by adding a cocoon coat and a pair of gloves it’s ready for the elements and any exterior activities like a Santa Claus parade or an outdoor market! MIX + MATCH DELICATE + DURABLE – Don’t be afraid to mix and match pieces that might come from different categories in your closet. For instance, this tank is crepe silk and typically hangs out in the ‘dressy’ section of my closet. 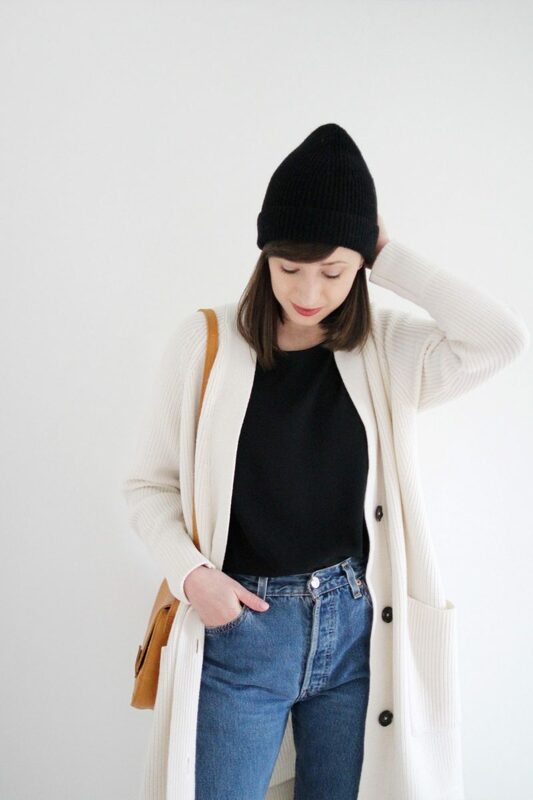 Meanwhile, these vintage jeans, chunky sweater and sturdy boots reside in the more ‘casual’ section. Combining them makes for a nice balance of delicate and durable elements. 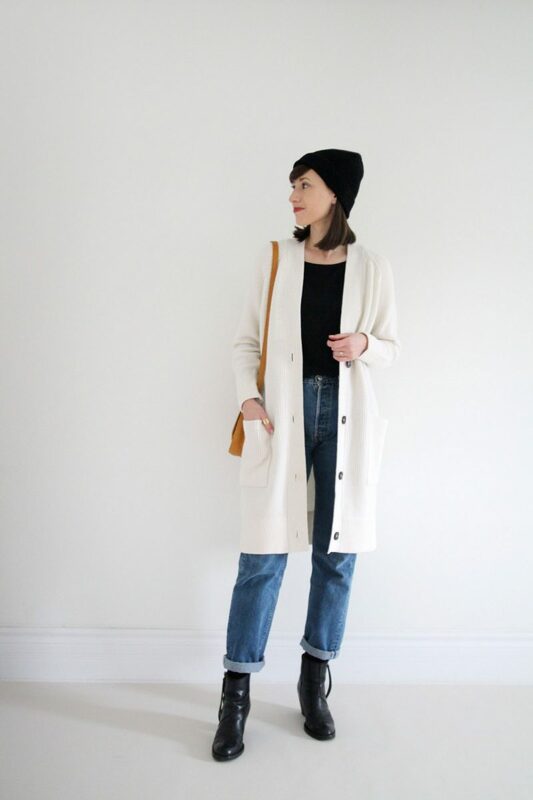 WINTER WHITES – We often shy away from white in the winter but I love wearing it! 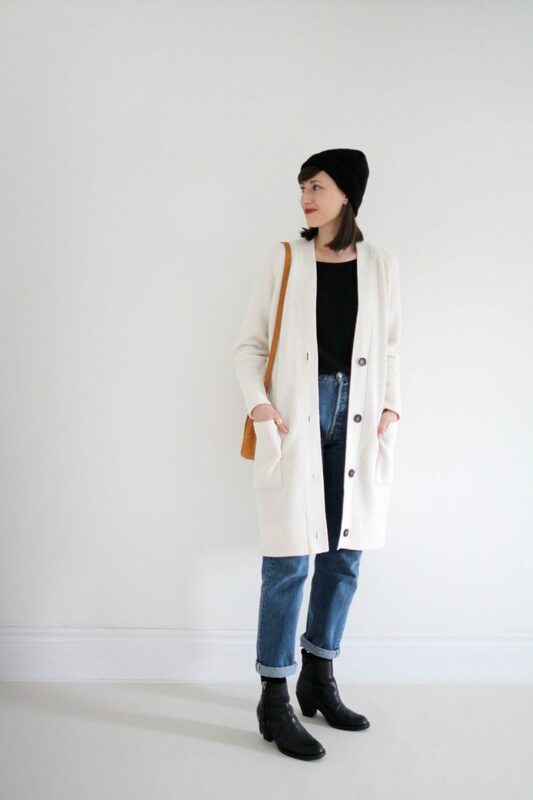 White tones feel fresh and add some lightness to a look without being overpowering. 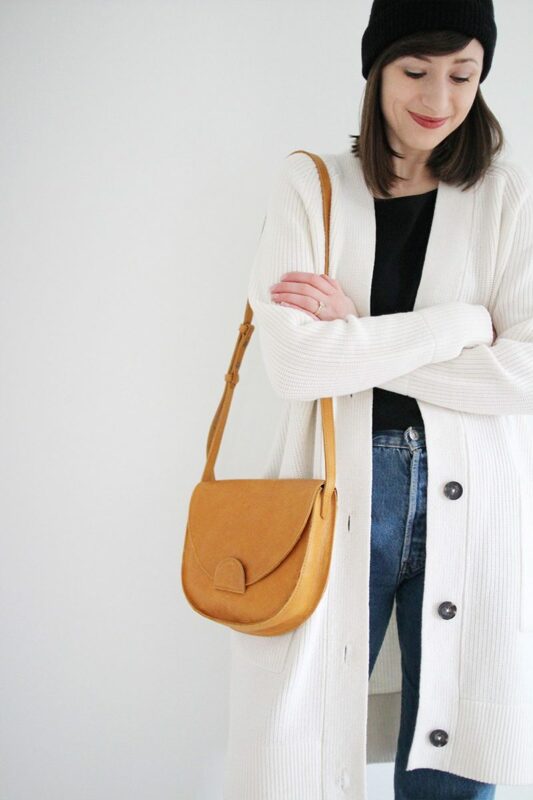 A TOUCH OF COLOUR – This look felt like it was missing something until I tried my cognac cross-body bag with it. The warm leather instantly brought the look to life. Sometimes one stand-out element is all you need to complete a look. 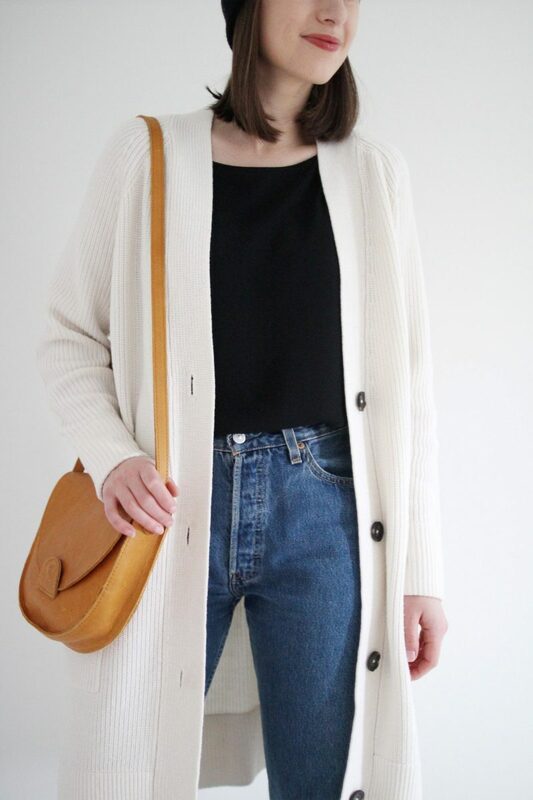 SWEATER COAT – old – Similar option here and here. LEVI’S – vintage – Similar option here and here. BLACK BEANIE – bought by me – old – Linked to similar. I hope these looks give you some easy style inspo for the holidays! I’D LOVE TO KNOW, HOW DO YOU APPROACH GETTING DRESSED & STAYING GROUNDED DURING THIS TIME OF YEAR? 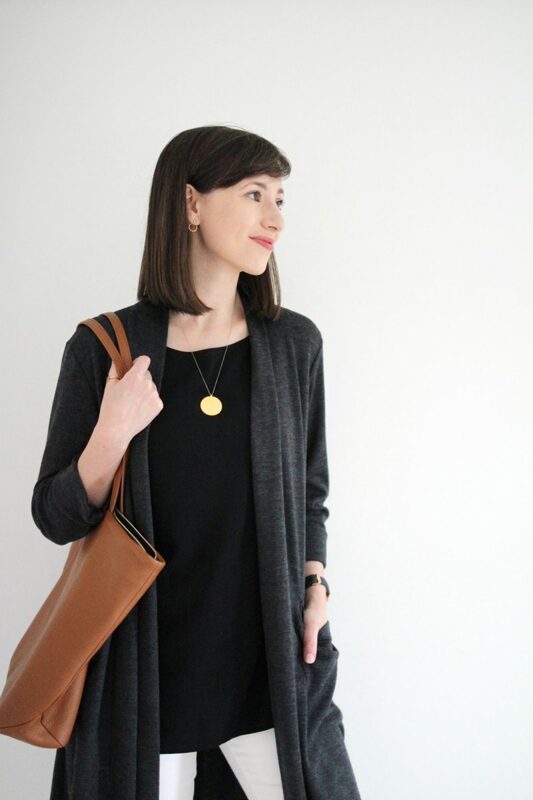 STYLE BEE PARTNERSHIP: This post was sponsored and produced in partnership with EILEEN FISHER, a responsible brand that I believe is doing some pretty special work! 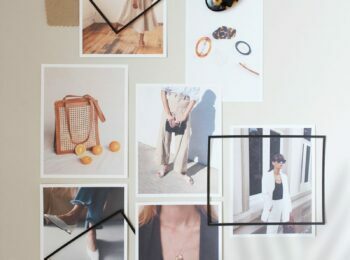 Click through to learn about EILEEN FISHER’s Supply Chain, Renew Program, Certified Dying, Vision 20/20 and so much more going on behind the label. I only work with and recommend brands/products that I am personally interested in and feel are a worthwhile investment. As always, all opinions are entirely my own. Thanks for supporting the brands that support Style Bee! 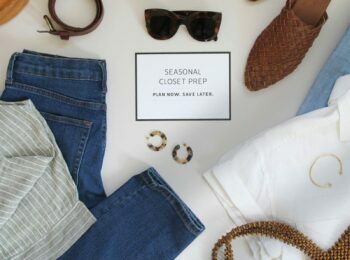 I’m more of a holiday wardrobe maximalist because i often have performances or more formal parties to attend, often in very cold weather, but one of the ways I manage that is by designating a day early in the season to try on all the outfits and choose in advance, and then using my Cladwell app to create a packing capsule for any travels. 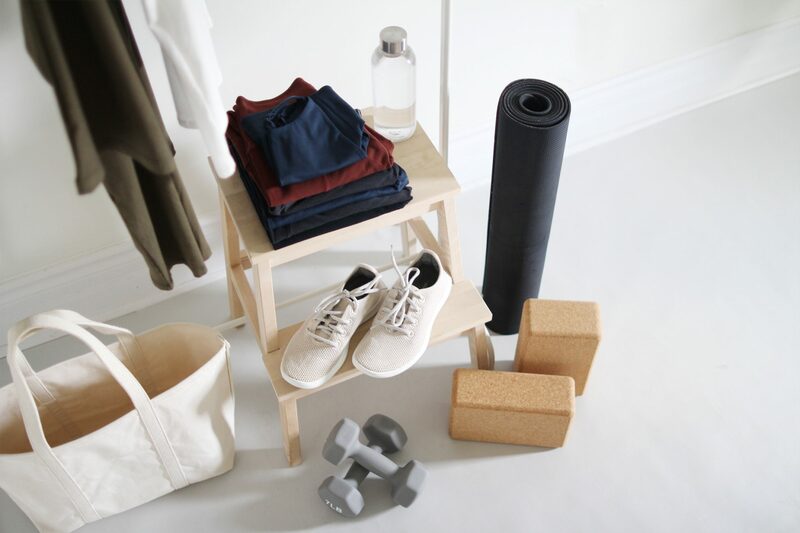 For everything else: minimalist. Small decorations, gifts for kids only, focus on having quietly enjoyable experiences together. I have this top in the off-white color and sometimes I struggle with ways to wear it (so basically, this post is perfect-timing!). Curious how well it tucks, as it seems like there is a lot of fabric? 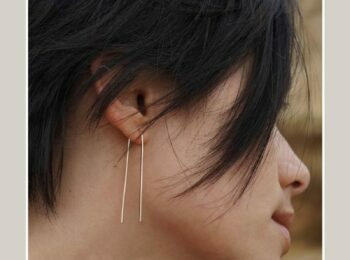 I love how wearable and practical these looks are! Sometimes this time of year I start to feel like the whole internet is telling me I NEED a gold sparkle top or green velvet pants. Those aren’t my style at all, but the message seems to be that it’s not festive to just wear normal clothes that you like. Thanks for making holiday outfits I would actually want to wear! I love Look #2! That blazer is gorgeous and the brown boot with the black outfit convinced me to buy those boots in brown instead of black. Merry Christmas to me! Great looks as always, lady! 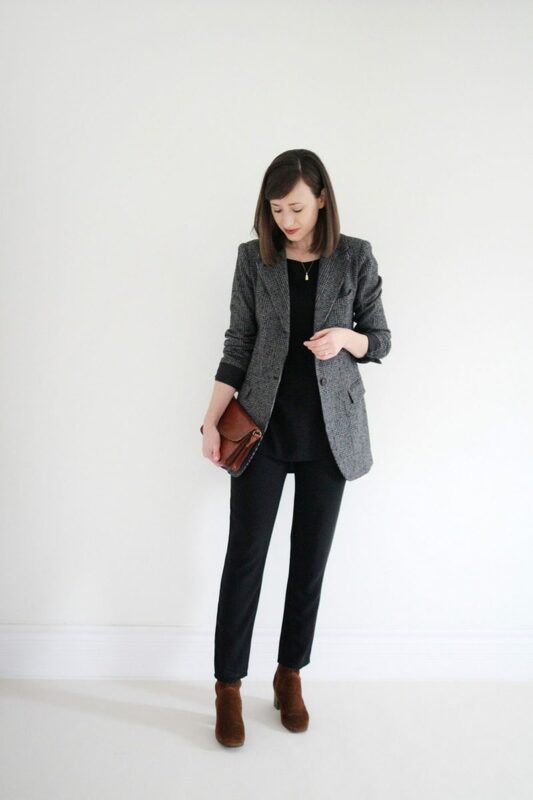 The second look with the blazer is just perfect. Hope you and Dave have a great holiday season and safe journey ahead! I love your looks, especially the blazer.